Bad Hofgastein is a spa town in the Gasteinertal Valley of Salzburg. It is situated in the south of the province′s Pongau region and has a total population of approximately 6,700. Bad Hofgastein is well-known not only as a spa town, but also for excellent skiing facilities. The town has been rather important in Roman times, since it was the centre for gold and silver mining that was done in this part of the Tauern mountain range. Bad Hofgastein has a shared skiing area with Gastein, the so-called Skischaukel Schloßalm-Angertal-Stubnerkogel, is part of the skiing area association Gasteinertal and Ski Amade. It comprises of 80 kilometres of slopes, five cable cars and 14 other ski lifts (drag lifts and chair lifts). Bad Hofgastein is very popular among Italians; this is probably largely due to the spa, the Alpentherme Gastein. The combination of hot thermal water pools and skiing can be found only in a hand full of towns in Austria. It is attractive enough to allow the hotels of Bad Hofgastein to sell some 145,000 over-night arrangements per year, largely during the winter season. During the summer season, Bad Hofgastein has over-capacities and tries to sell hiking vacations and promotes Alpine summer sports. The 28 mountain cabins (Almen) of Bad Hofgastein alone and several more on other parts of the Gasteinertal help with that. Another all-year-round attraction is the Heilstollen of Bad Hofgastein, a famous ancient mine that contains low concentrations of natural radon. This radio-active noble gas is applied for therapeutic treatments of skeletal and cartilage conditions. In terms of other attractions, note the parish church of Bad Hofgastein. It was first reported in the 9th century, but the current Gothic building was erected in the 15th century. There are modern sport facilities, a pedestrian zone and a convention centre. However, don′t expect too much of a traditional village - Bad Hofgastein is a modern town and has given up much of its regional character. Today, you have to look closely to find traces of Bad Hofgastein′s turbulent past, even though it was eventful and shaping. The Romans built excellent roads through the Gasteinertal, which came in handy in the Middle Ages, when Bad Hofgastein became a very important player in the trade between Central Europe and Italy. 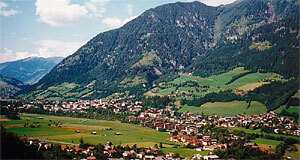 The Prince Archbishop granted market rights to Hofgastein in the 13th century. Gold inflation, plague and religious conflicts led to the deterioration of the town after approximately 1500. Only after Salzburg lost its independence and became part of Habsburg Austria, Bad Hofgastein recovered: In the 1820ies, when taking the cures became fashionable, the demand for spa towns grew. A pipeline was built in 1830 to carry thermal spring water from Gastein to Hofgastein and feed the spas there. Even though nearby Bad Gastein had more of a reputation as a spa town in the late 19th century, it was Bad Hofgastein that grew to the biggest community in the valley and developed into a modern town in the 20th century. It is now the biggest community of the Gasteinertal, mostly owing this to the fact that it is situated at the widest part of it. Bad Hofgastein simply had more space to grow than its neighbours. The word "bad" refers to spa (compare to "bath") in German; Hofgastein refers to the court that the Prince Archbishop built here and which was responsible for all of the Gasteinertal Valley - thus the name: Court in Gastein, more recently upgraded to spa.